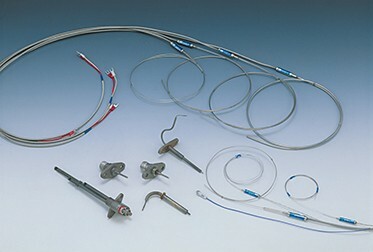 Toshiba Materials' thermocouples have outstanding insulation performance, environment resistance and mechanical strength, and are used in a wide range of fields from various forms of temperature measurement for general industrial purposes to measurement of exhaust temperature in aircraft engines. 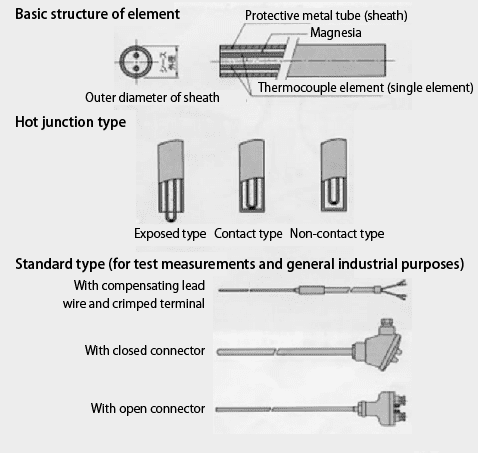 A thermocouple is a structure in which a thermocouple element is placed in a protective metal tube along with dense, high-purity magnesia powder. This provides outstanding insulation performance, environment resistance and mechanical strength, making thermocouples suitable for a wide range of purposes from various forms of temperature measurement for general industrial purposes to measurement of exhaust temperature in aircraft engines.